in black mottled bracts on stem tips. and clones of knickknack shops that claim Little Italy. as one scientist puts it, but mean. He plunges, two steps at a time, into Canal Street Station. in the young white men and lurches into them. The train shrieks. by tower blocks, to be traced with the red thread of a previous visit. to determine if bioagents work. of seedhead gallflies looks promising. over his white boy’s blue veined torso. This is also his farm. For some reason I thought I should imbibe some science while feasting on graduate writing workshops. At informal weekly seminars, in the spirit of continuous learning, the science faculty was giving brief talks on a subject out of their field of specialization. The talks were open to all. They attracted a modest but devoted audience, not a bad showing for a small liberal arts college. The free pizza might have helped too. 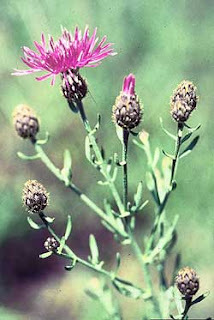 Was it a physicist or a chemist who spoke about the spotted knapweed? I don’t remember. It was a woman who found a new weed while gardening, and went online to find out more. I followed her lead. My research turned up university and state department websites aimed at American farmers. The websites, with titles like Idaho’s Noxious Weeds or Invasive Plants of Wisconsin, were similarly organized: Description, Prevention, Management. Having just arrived in the States, and hoping to find love and work here, I was sensitive to the characterization of the spotted knapweed as an alien threat to native plants. The language of the description, so eerily similar on the sites, started me thinking about what makes a plant a weed, and what makes it a crop. Human needs, yes, food, clothing, shelter. But also cultivation, which necessarily implies human culture. The difference between weed and crop is, in a significant sense, a cultural distinction. grass and re-routing the elks. Thirty-five states index it an invader. on tips of terminal stems. It winters in a rosette of deeply lobed leaves. it migrates along highways, railway tracks, utility lines. Overrun by the weed of excitement, I took the draft to my writing class, as well as submit it for critique @ Poetry-Free-For-All, an online poetry workshop. The draft was justly torn apart. Neither dramatic nor a monologue, it was, as Ted from PFFA nailed it, “a book report.” Its polemic was self-righteous and unimaginative; it does not question itself. A PFFA exercise stimulated an overhaul. Challenged to write a poem with a mixture of different styles, I thought of weaving a personal narrative through the knapweed rhetoric, in alternate stanzas. I did not merely want to put a face to the debate, as immigration advocates would say, I wanted to speak of my desires—to write, to love, to take root—fierce desires that seemed to justify anti-immigration fears. in the young white men and loves each one. The train sings. he scribbles his name, number and address at the front desk. bio-agents work. A species of seed-head attack flies seems promising. the shaft of Matt’s torso and plants his rice. This is also his farm. The writing was still rough, but the two different styles, underlined by different stanza sizes, played off each other nicely, as Harry, Searcher and Autumn @ PFFA helpfully confirmed. Harry also suggested replacing “seed-head attack flies” with “seed-head gallflies” to lower the noise volume, a suggestion I accepted immediately. Having banged down the slats of the narrative, I examined the selection of details in the poem. The knapweed stanzas still felt too prosaic and choked. I did not think of writing them in prose; the next thing that overran my field of attention was Auden’s “The Shield of Achilles.” Also a poem that deploys two different styles, it accentuates the distinction through different line lengths. xxxxxxxxAnd a sky like lead. grass and re-routing the elks. Forty states index it an invader. The weed winters in a rosette of deeply lobed leaves. blooms in stiff, black mottled bracts on stem tips. And yet. And yet. What if prose is the right form for the knapweed material which, after all, is written that way on all those university and state department websites? What if my revision of the knapweed stanzas was based on the wrong diagnosis of the problem? What if my creative writing teacher was right, the knapweed stanzas are overly intellectualized and emotionally manipulative, and should be removed? The field of possibilities. To turn once more to the conceit, how does one distinguish between crop and weed? The published poem once fed, clothed and sheltered me. It will not do now, but perhaps it may for someone else. Pizza, anyone?